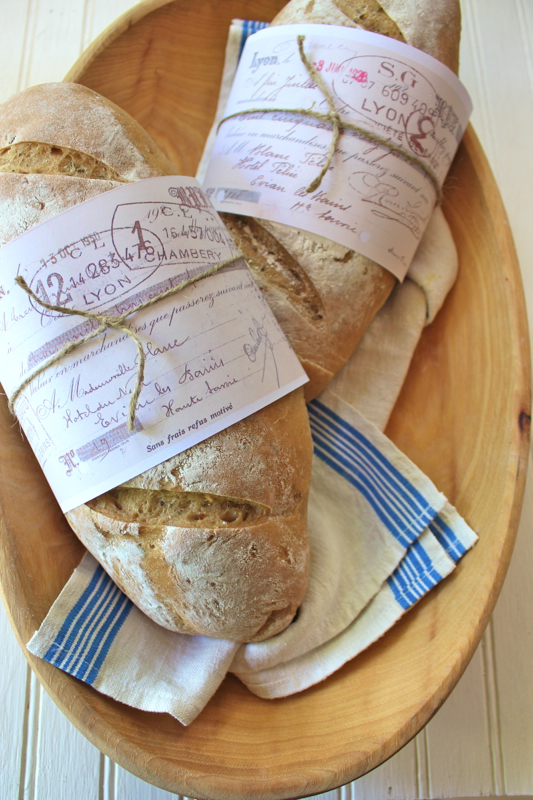 There is no better way to start a blog post on Paris than with French bread. Baguettes are available in every Boulangerie in France and it seems that every other person that you see on the street has one tucked under his/her arm. This was my attempt at duplicating it a while back. You can find the recipe here. We are back from our two week trip to France and are slowly easing back into our normal time zone. 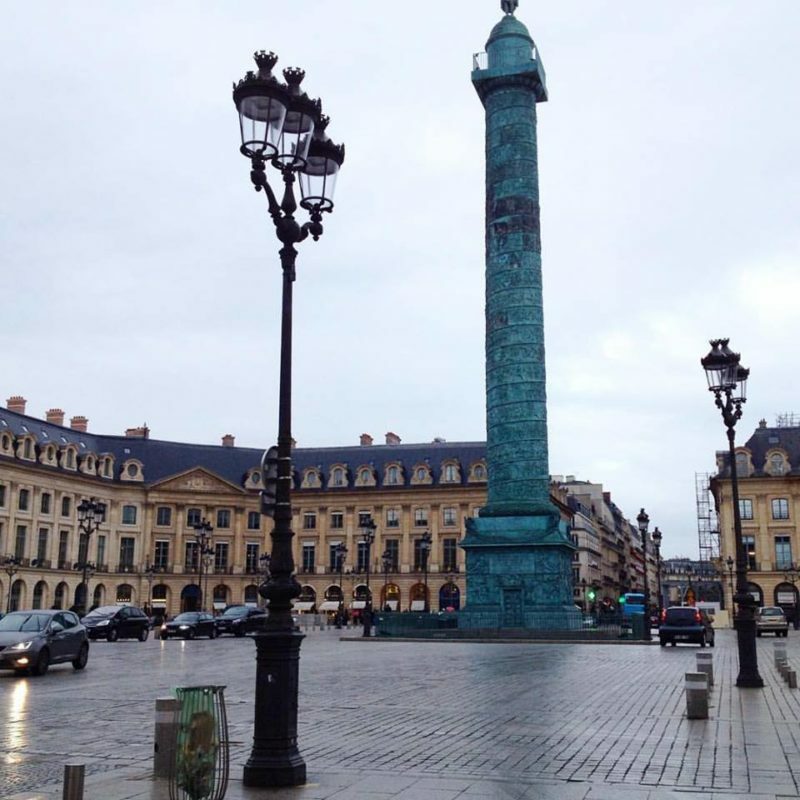 On a drizzly day in Paris, we walked from our apartment near Notre Dame Cathedral in the 5th Arrondissement to the Place Vendome in the 1st Arrondissement. We were with our French friends Laurent and Carole. Place Vendome is home to the Paris Ritz Carlton where Lady Diana was staying before her unfortunate accident. The Ritz is temporarily closed for renovations. All of the high end jewelry stores are also on the square. We also visited the Palais Royal. 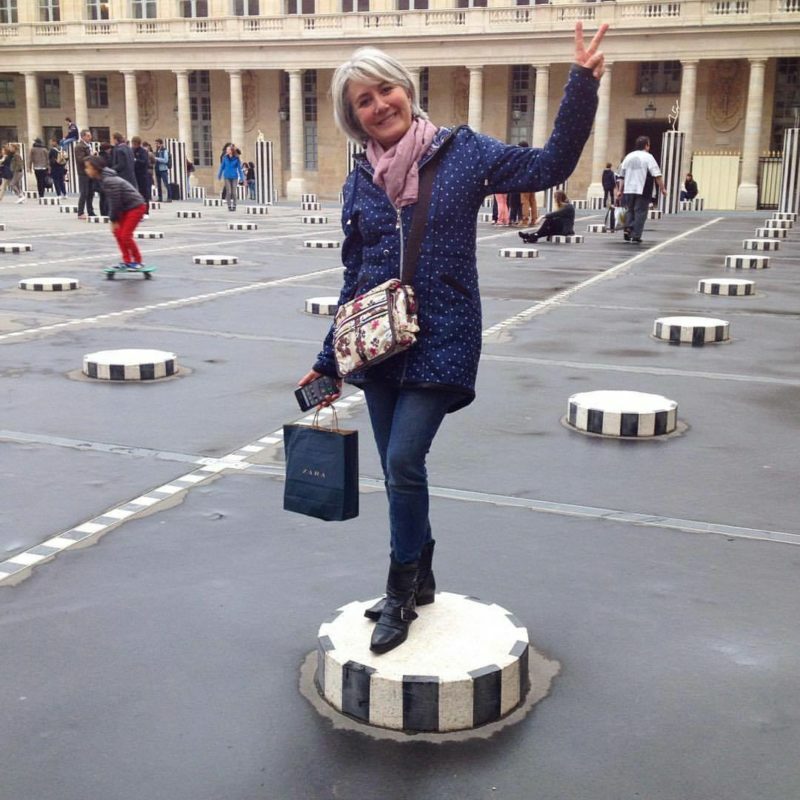 The inner courtyard was transformed in 1986 by a controversial art installation known as Les Colonnes De Buren. 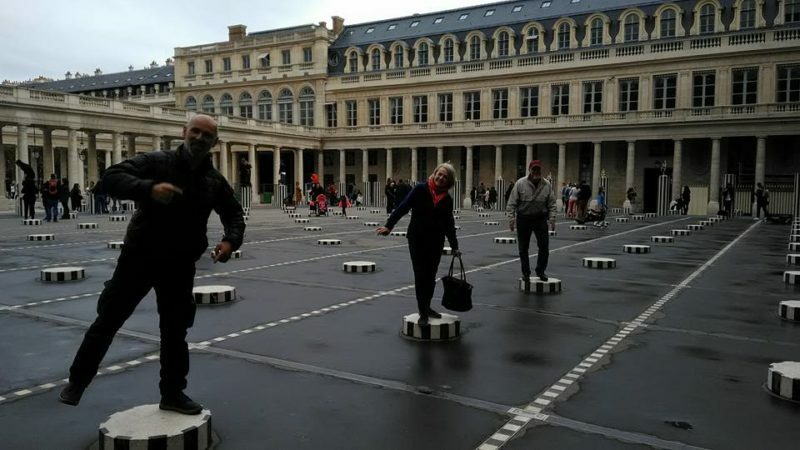 The artist, Daniel Buren, envisioned a conceptual grid of varying heights of black and white striped columns. Many thought that the whimsical columns clashed with the classical architecture surrounding them. But today it appears that people are enjoying the whimsy. There was even a bride and groom posing for their photographer on two of the taller columns. Our French friend Carole also posed. I couldn’t enhance the previous picture because it was on another camera, but this was from Instagram on my iPhone. Love the options for enhancement on Instagram. Love Carole’s French elan. 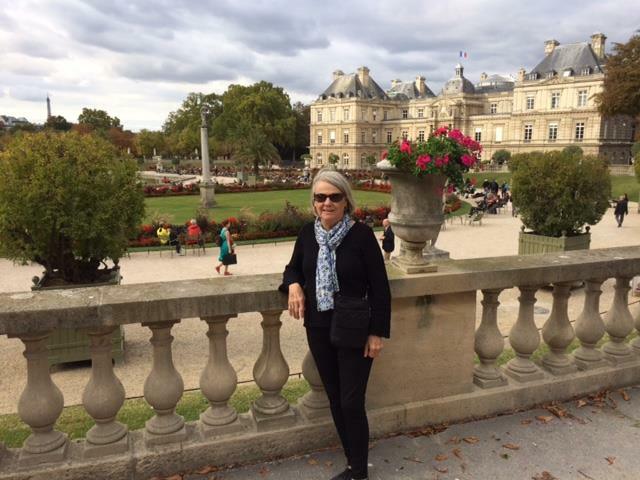 On a sunnier Fall day we spent some time in the Luxembourg Gardens. The Luxembourg Palace was commissioned by Marie de’ Medici, the widow of Henry IV. She designed the gardens to conform to designs from her native Florence. 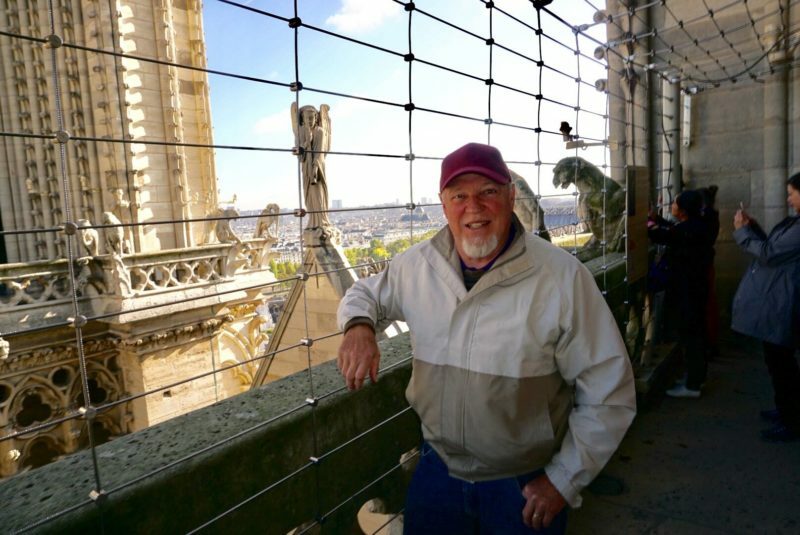 David got up early one morning and walked the several blocks to Notre Dame with the intention of climbing to the top of Notre Dame Cathedral to commune with the gargoyles. I am pleased to report that he made it to the top. The 400 steps winding upward were a challenge but he was proud that he made it. Not bad for a 70 something guy. The views of Paris were awesome. 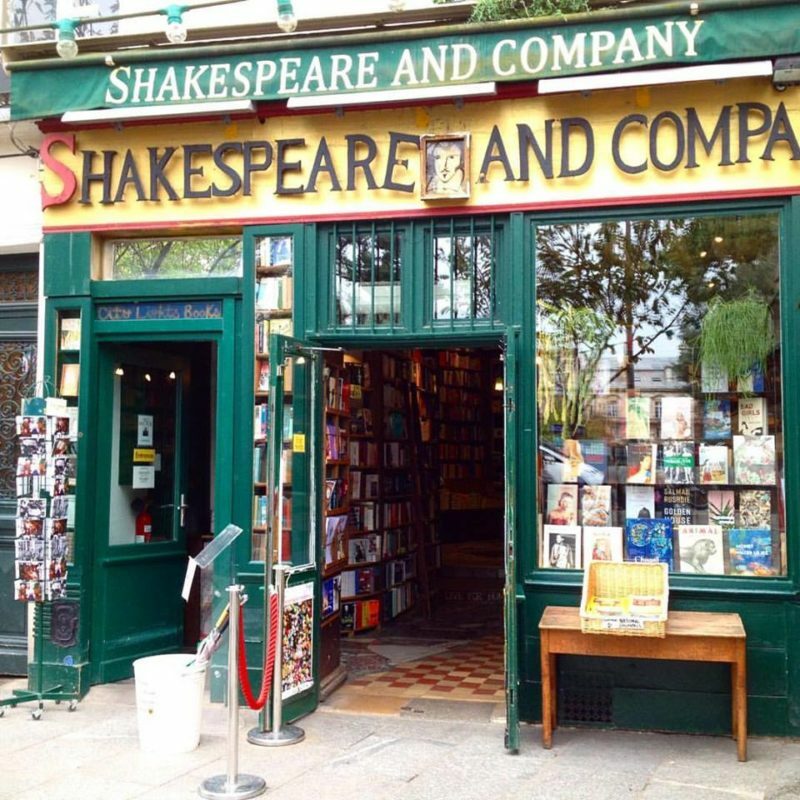 We enjoyed visiting the iconic Shakespeare and Company. This bookstore has been around for decades and was a hang out for some of our most illustrious American authors. Browsing the books was enjoyable and we also appreciated the staff who Googled information for us. It is such a friendly place. 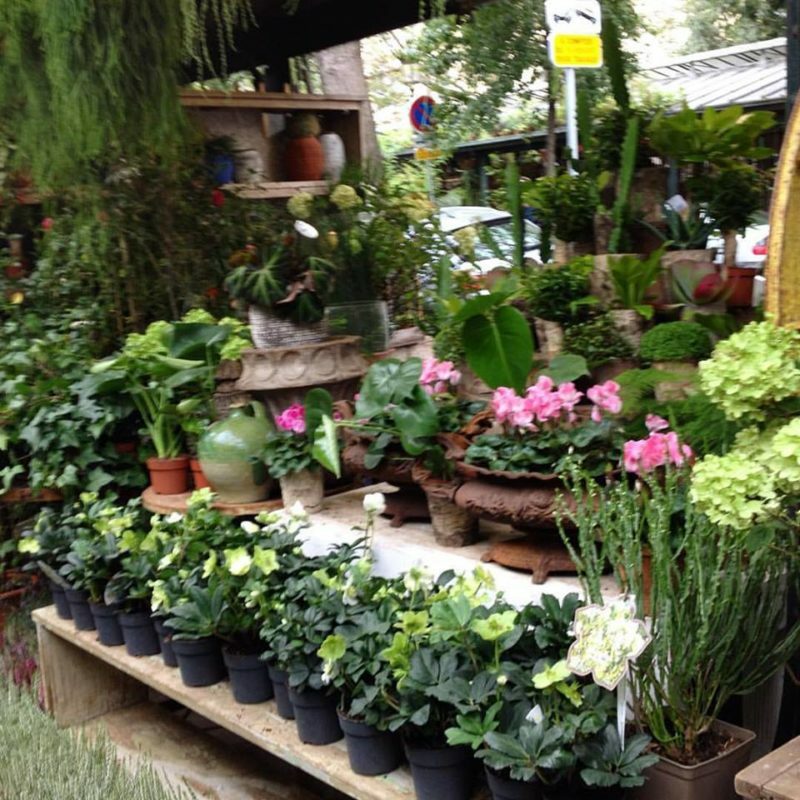 After leaving Shakespeare and Co. we crossed the bridge to the island of Ile de Cite to walk through the Flower and Bird Market. It is always a tranquil place in the busy city. 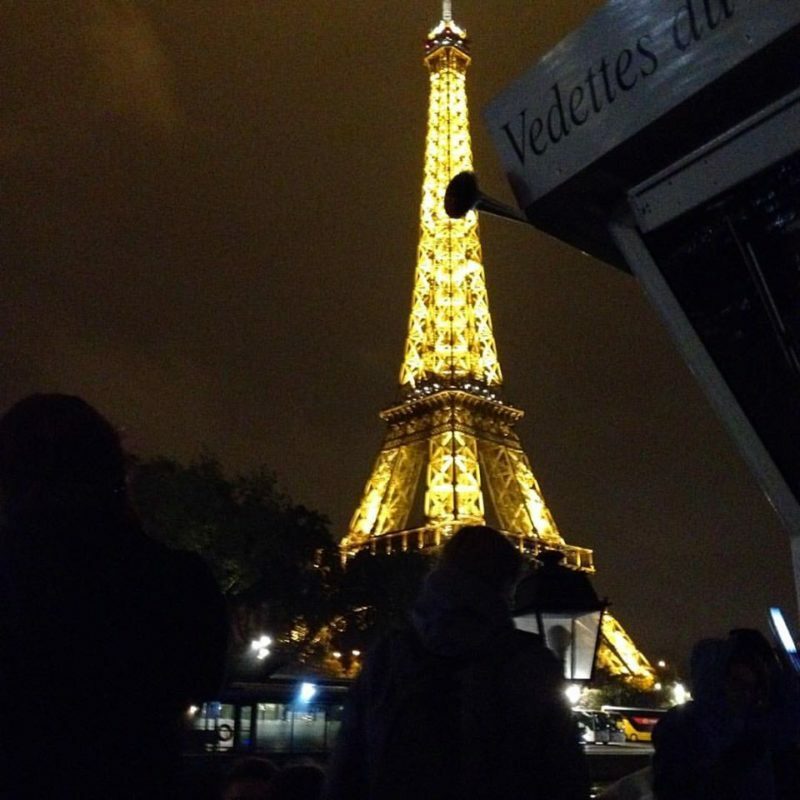 We ended a day with a river cruise on the Seine. J’aime Paris. There will be more about restaurants in my next post. Posted on October 15, 2017 at 1:16 pm. We leave for France on Tuesday. It has been a long time in the planning. 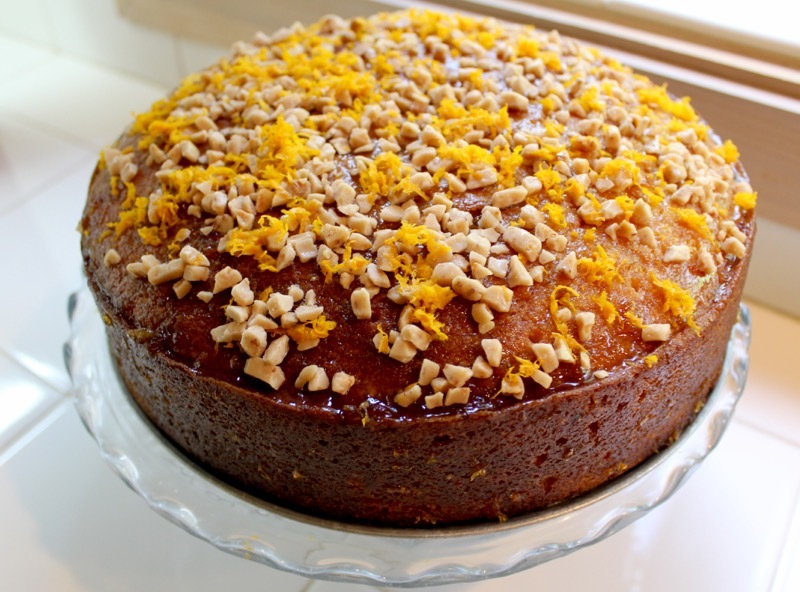 In honor of our upcoming trip, I made Mimi Thorisson’s Pain D’Epices. It is a humble spice bread that is good in so many ways. 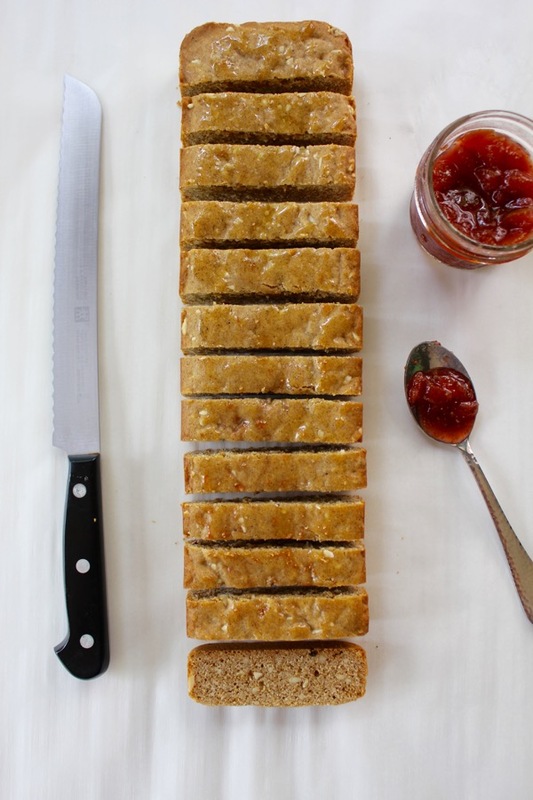 Serve it warm smeared with butter, top it with hummus for an appetizer, or spoon on your favorite jam. It can be anything that you want it to be. 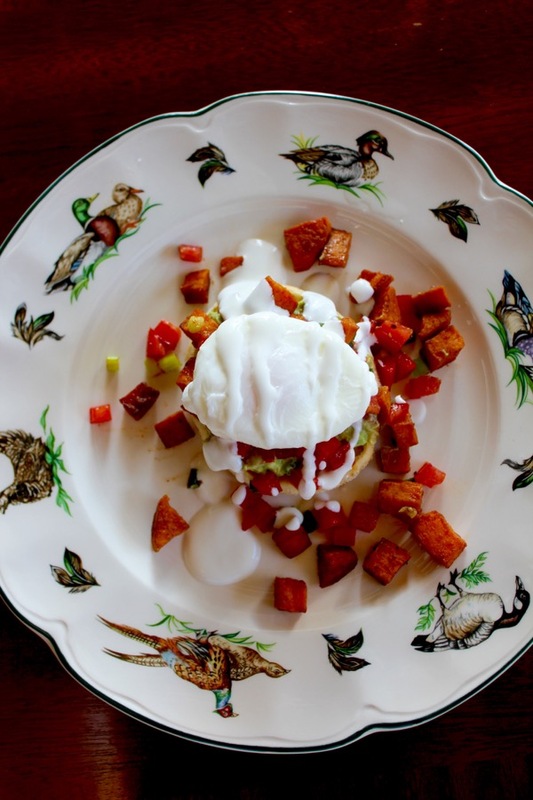 It is both sweet and savory. The following are some of the places that I am considering visiting in Paris. We will be staying in the Latin Quarter on this trip. We previously stayed in the 7th Arrondissement near the Eiffel tower. I am very familiar with that area of Paris. 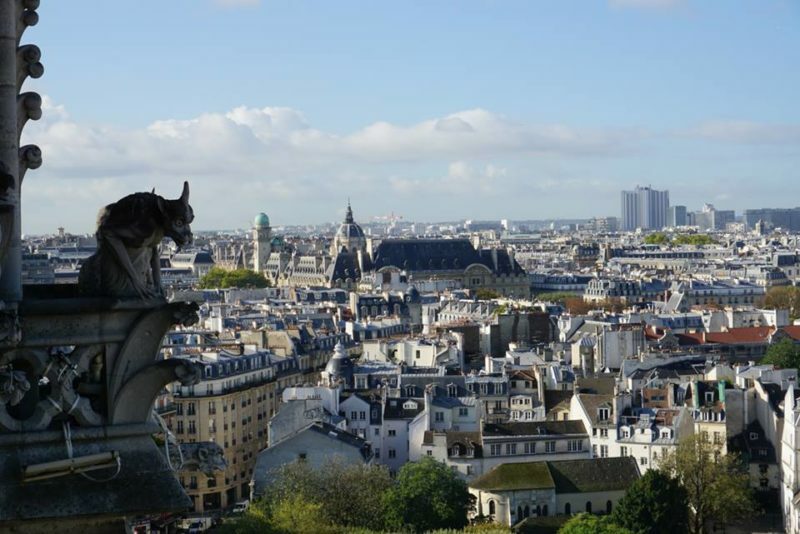 The Latin Quarter is in the 5th Arrondissement on the Left Bank. There are so many historical points of interest there. Our apartment is a block from the Sorbonne, the famous Paris University specializing in the arts, humanities, and languages. But it is also close to Shakespeare and Company. The original bookstore was opened in 1919 and was a refuge for many early American writers like Hemingway and Ezra Pound. The current location is close to The Notre Dame Cathedral. Le Petit Châtelet is next door to Shakespeare and Company. Even though it is in a touristy area, the restaurant is authentic and charming with a delightful view of the cathedral. 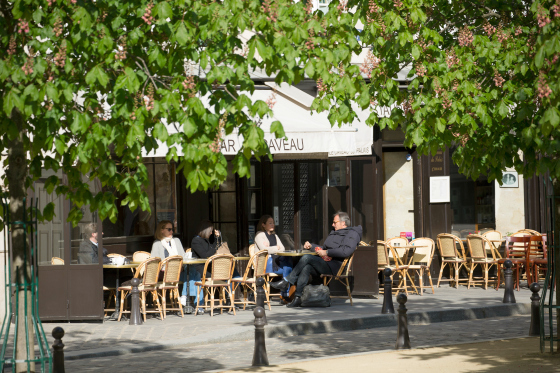 Le Caveau du Palais is in a quiet pocket on Ile de Cite. 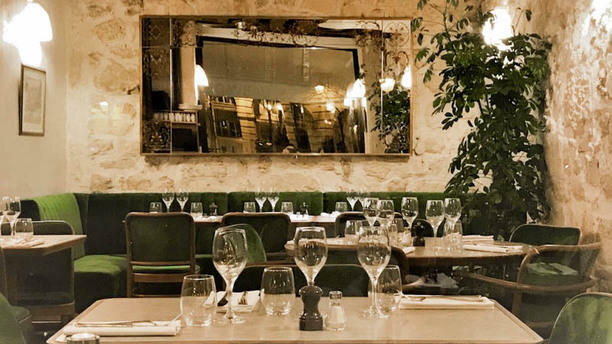 The restaurant is what the French call charme fou, utterly and incredibly charming. It is on Place Dauphine, a tranquil triangular park. Outside seating is a pleasant option while watching elderly men playing Pétanque in the adjacent park. It would be a pleasant place for lunch. 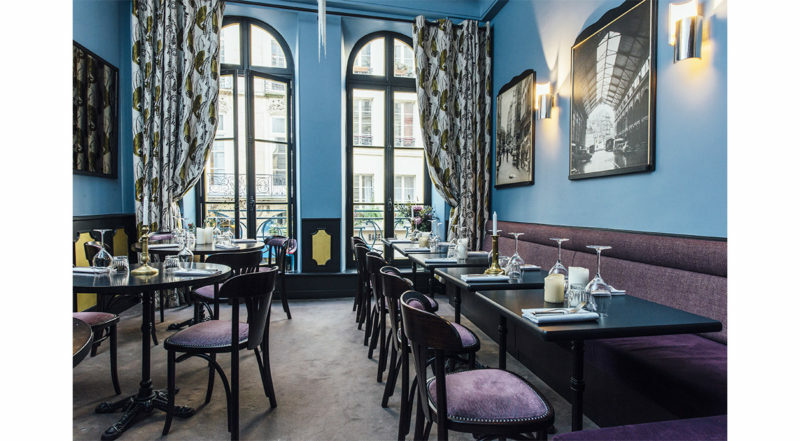 With Gingham curtains at the windows and the smell of wood smoke in the interior, Robert et Louise has been a Marais destination for generations. 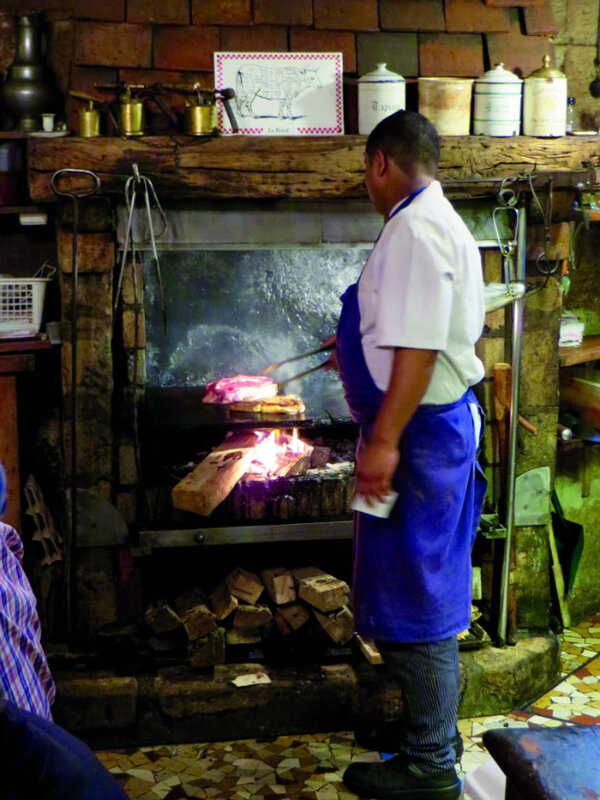 Specializing in steaks cooked over a wood fire, it would be a good choice on a cool evening for French comfort food. 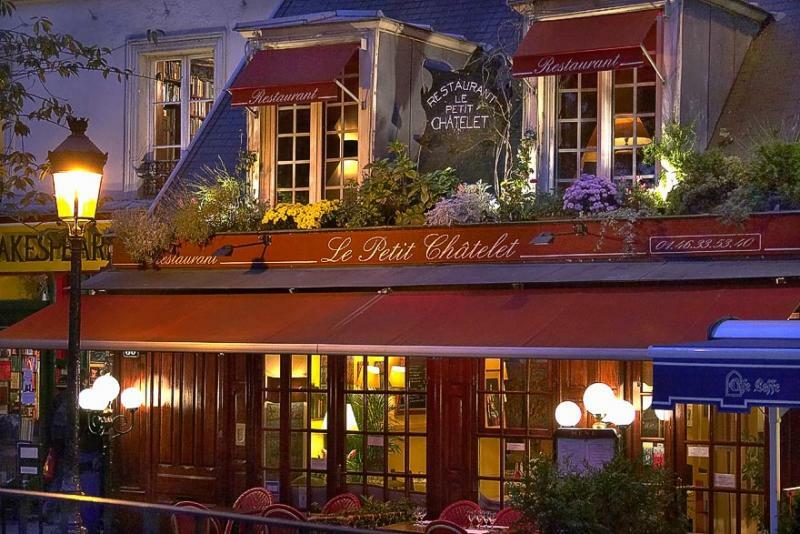 But for our special night out, we have chosen Chez la Vieille. “La Vielle” literally means old woman. 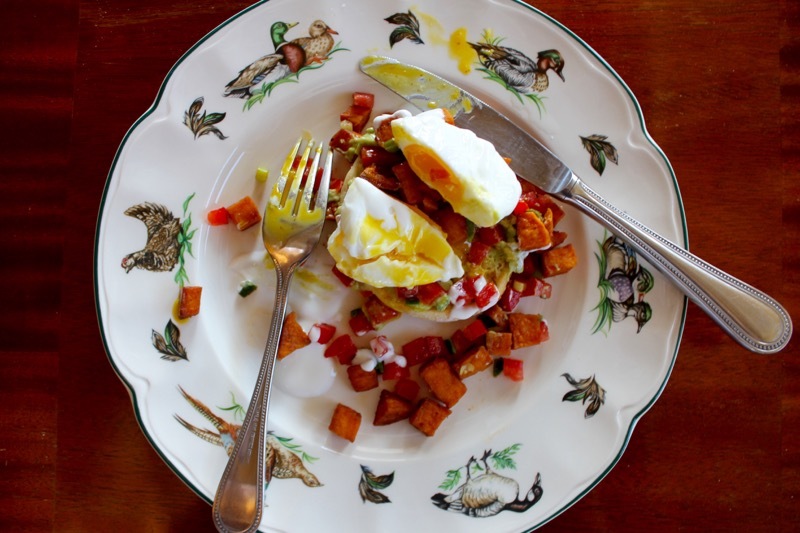 The restaurant was started by French cook Adrienne Biasin who had a strong French temperament. When it closed in 2012, Chicago born chef Daniel Rose (of the popular Paris “Spring” restaurant) decided to re-open it. It has been redesigned but retains many of the old school dishes like blanquette de veau. 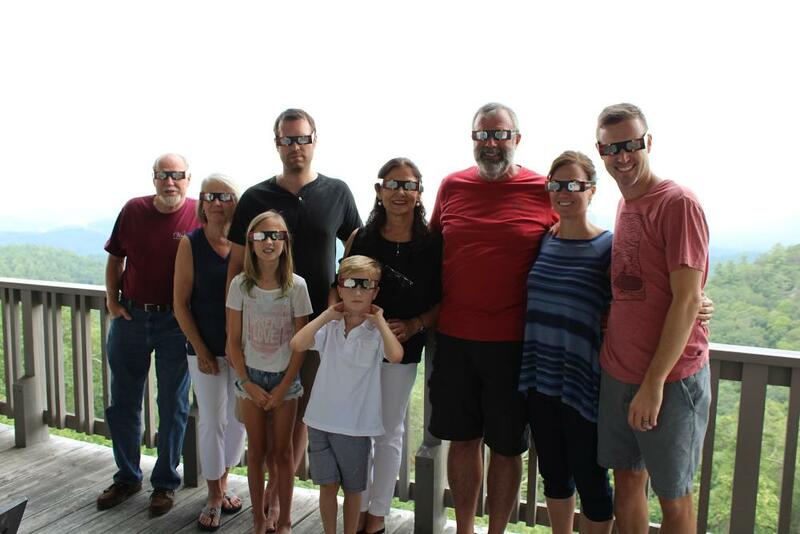 I will try to post to the blog while we are traveling. But I will definitely be posting pictures to my Instagram account. Hope you follow me there. Au Revoir. 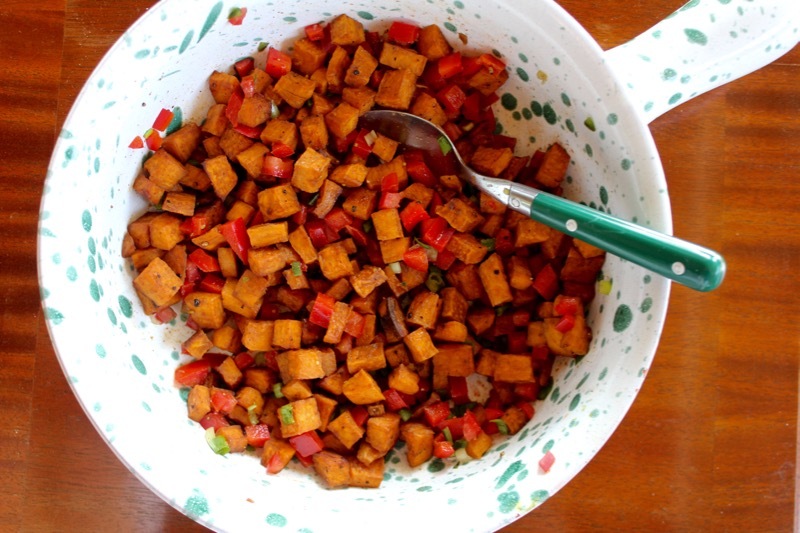 In a large bowl, combine the flours, almonds, baking powder, cinnamon, nutmeg, cloves, and ginger. Add the honey, melted butter, and egg yolk and mix well. Scrape the dough into the prepared pan and bake until a knife inserted in the center comes out clean, about 40 minutes. Unmold and let cool at least slightly before serving. This is good at room temperature. Posted on September 23, 2017 at 9:01 am. It is fig season. 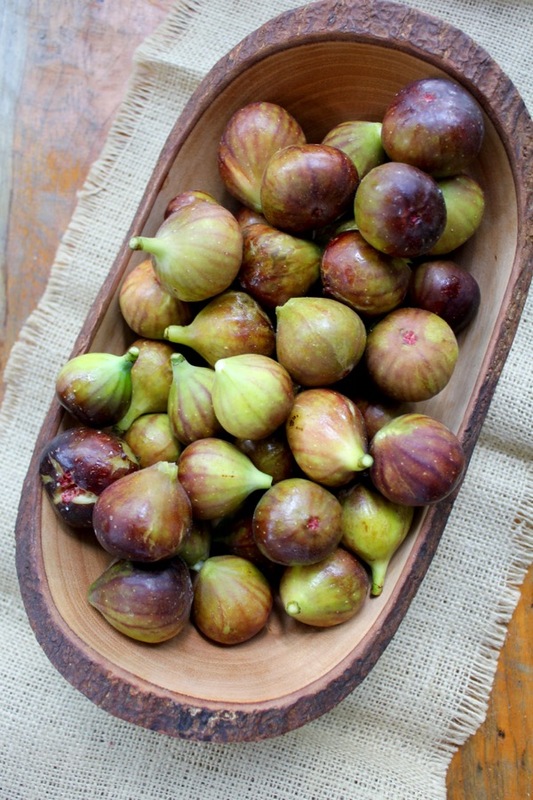 When figs are ripe they must be used quickly as they do not have a long shelf life after picking. One of my neighbors here in Lake Lure has a fig tree and she generously shares with several people. I am glad to be one of them. Last year I made a Fig and Almond Cake and a Fig and Goat’s Cheese Tart. This year I had little time so I decided to turn my bounty into fig jam. It couldn’t be easier. It is just a matter of chopping up the washed figs and adding them to a pot with sugar and lemon juice and cooking until thickened. Stir occasionally while you are occupied elsewhere. Jam making is such a virtuous pursuit. Looking at the jewel-like contents of the jars makes me feel like I have accomplished something worthwhile. To thank Donna for all of the figs, I made her these Orange, Date, and Pecan Muffins from Jamie Schler’s new cookbook Orange Appeal. 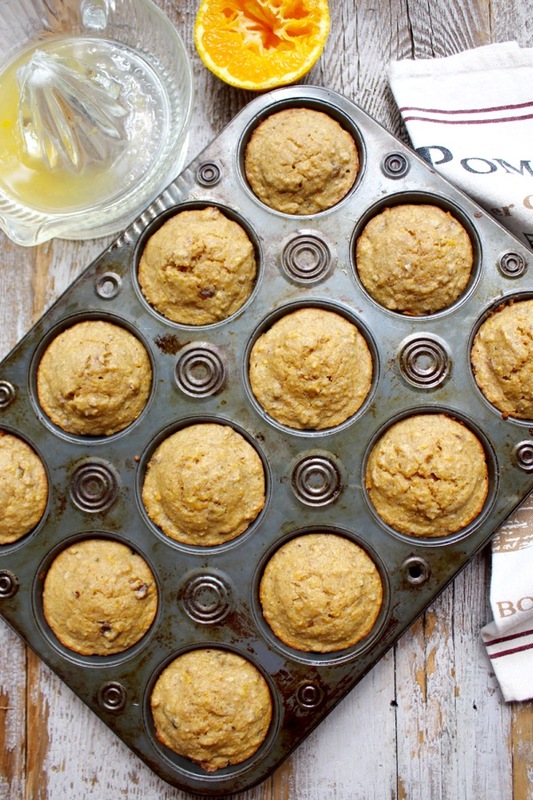 The orange flavor is intense in these muffins due to the addition of puréed orange pulp. I am enjoying all of Jamie’s recipes so much. 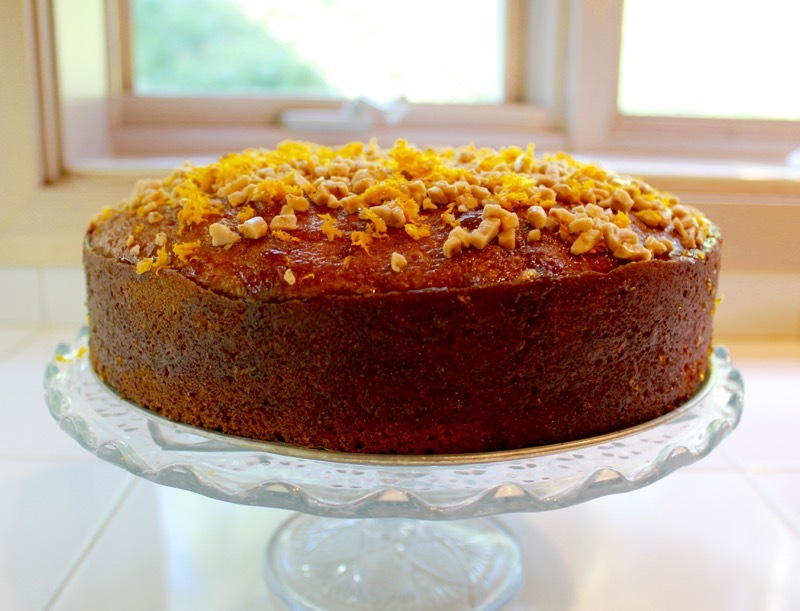 Orange Appeal is a worthy addition to your culinary collection. 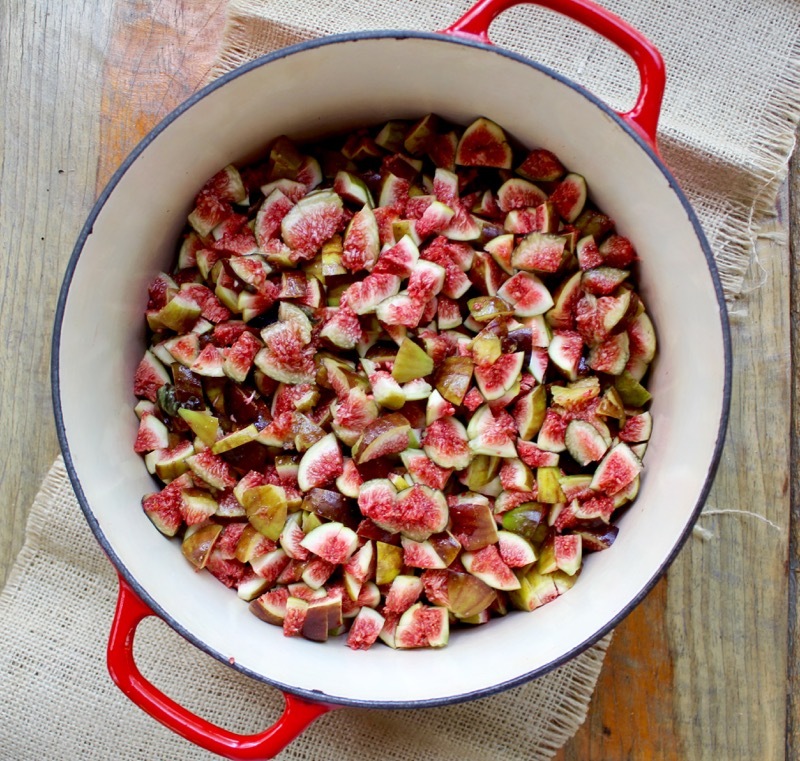 Place the figs and sugar in a large pot. Stir and let sit for about 15 minutes until sugar is dissolved. Add lemon juice and water and bring to a boil while stirring to combine. Turn burner to medium heat and simmer, stirring occasionally for about 20 to 25 minutes until fruit is soft and the sauce has thickened. 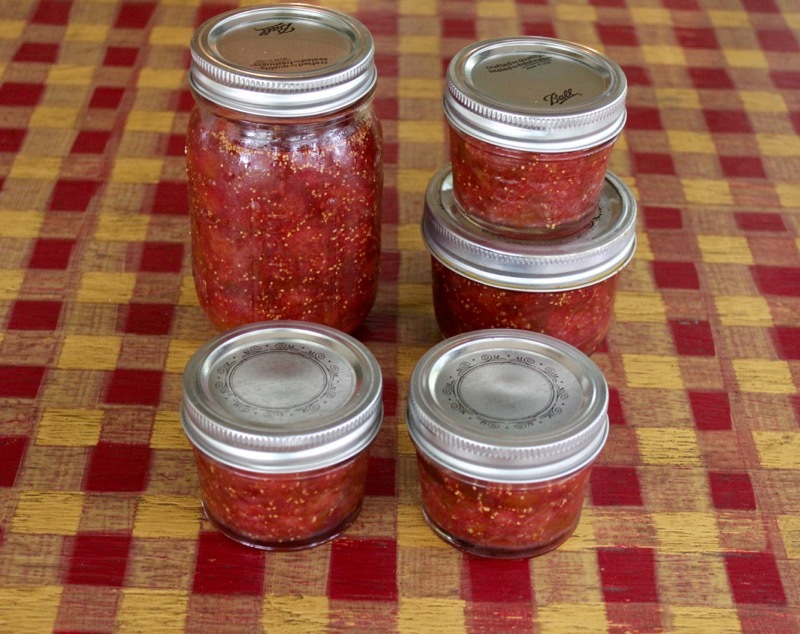 Place jam in sterilized canning jars with lids. Jam will keep in the refrigerator for at least 3 months. Posted on September 1, 2017 at 11:44 am. 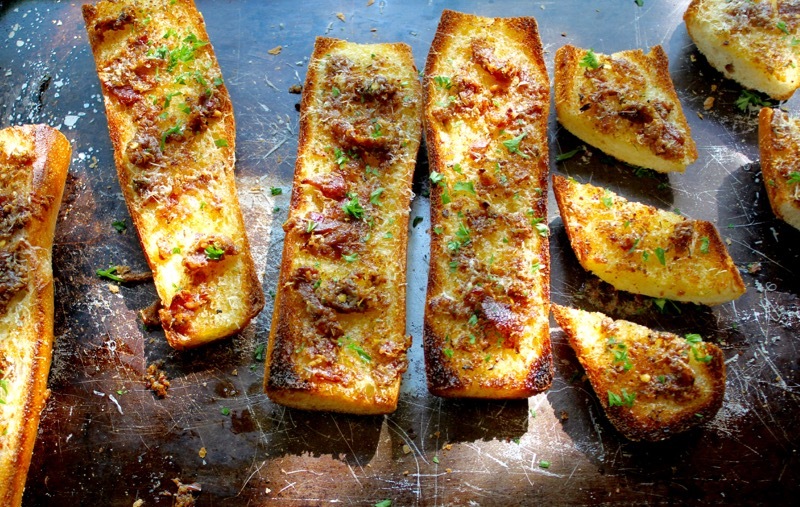 We all love garlic bread. I have made many versions over the years. But I have to say that this recipe is the most amazing I have ever made. Brought to the internet by Bon Appetit, I couldn’t resist making it. It helps that my weight-conscious husband is on a motorcycle trip and I can eat anything that I want for dinner. Last night it was bread and wine with a very small helping of cole slaw and pork. Usually a confit refers to the method of cooking duck or goose in their own fats. 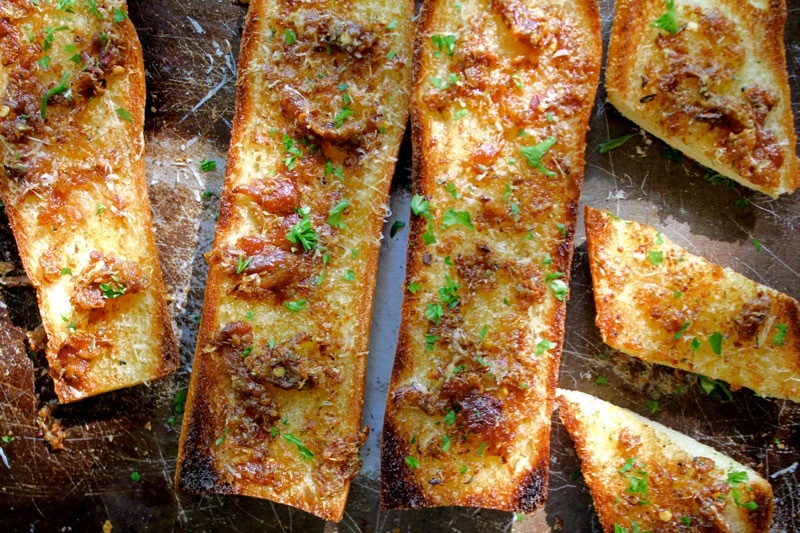 But in this case, whole cloves of garlic are cooked in butter until they are golden brown. the mixture is then mashed together with Parmesan cheese, oregano, lemon zest and red pepper flakes. 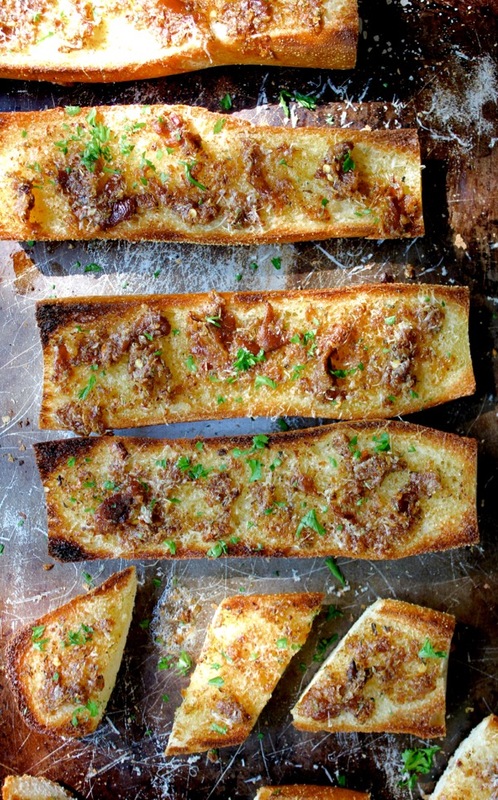 The mixture is spread on a sliced baguette and broiled. Be very watchful of the bread because it can burn easily. Not sure what I will do with the leftovers, but I will worry about that later. I thoroughly enjoyed my indulgence. My, oh my. This was good. Cook garlic in butter in a small covered saucepan over medium-low heat until golden brown and very soft, 15−20 minutes. Transfer to a medium bowl; let cool. Add Parmesan, oregano, lemon zest, and red pepper flakes to garlic and mash to a paste; season with kosher salt. Heat broiler. Slice baguette in half lengthwise, then crosswise. Broil, cut side down, on a foil-lined baking sheet until golden brown, about 2 minutes (watch carefully). Let cool slightly, then spread cut side with garlic paste. Broil until cheese is golden and bubbling, about 2 minutes. (Mine took only 1 1/2 minutes) Slice. Posted on July 14, 2017 at 6:59 am.